Roll-up windows do not automatically qualify your vehicle for antique plates, or what some states also refer to as vintage plates, collector plates, classic vehicle plates, and historical plates. Before applying, check with your Department of Motor Vehicles (DMV). Each state governs differently, but in general, you'll find the vehicle must be a certain age, based on the manufacturing date. In Oregon, for example, the car must have been manufactured in 1956 or earlier (this applies to 2012; the manufacturing date advances with each new calendar year), while in New York, cars must be at least 25 years old. If you're looking for an antique license plate for a motorcycle, you may have to wait longer. South Carolina, for instance, requires motorcycles to be at least 30. 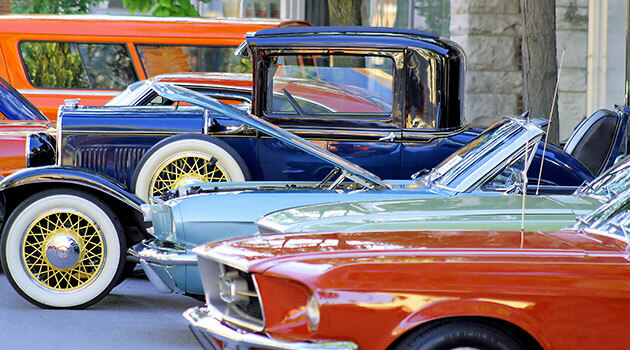 Participation in antique car club functions, parades, exhibits, and tours (this includes driving to and from the event). Driving to a garage for repairs. Driving to an auction or yard to be sold. A certain distance from home. Virginia, for example, allows antique vehicles to be used for pleasure drives that do not exceed 250 miles from place of residence. Antique vehicles cannot be used for everyday purposes like driving to and from work, or running errands. If your vehicle qualifies for antique status, apply for plates with your state motor vehicle agency. You'll follow the same steps as a regular vehicle registration, except for the need to complete a special car registration form for antique plates. Depending on your state, you may be charged a one-time car registration fee.